The Just Culture Algorithm™. This is the tool to evaluate the use of the 3 behaviors and 5 skills essential to building a just Culture. 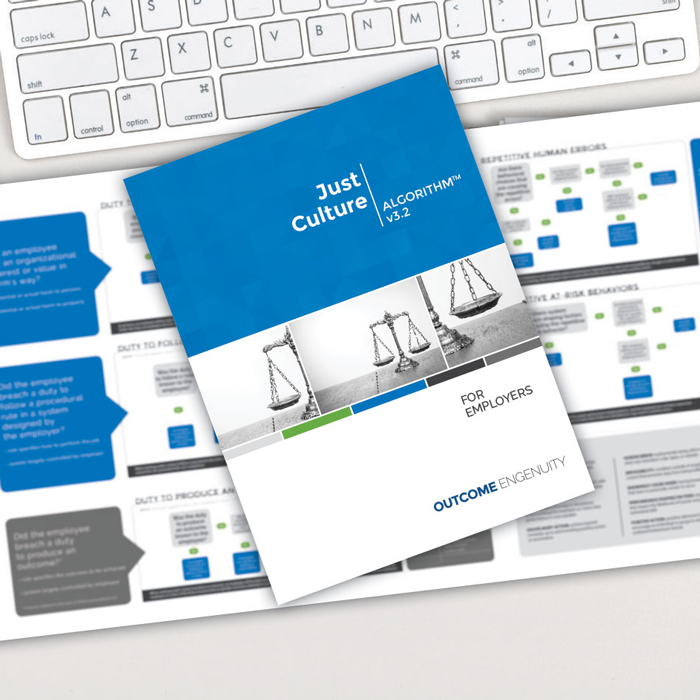 The Just Culture Algorithm™ is the analytical heart of Just Culture and is our primary tool for understanding and categorizing the choices of those in your organization. It serves as a guide when you, the manager, address employees whose behaviors do not align with organizational values or procedural rules. With it, you can evaluate an event based on a set of duties inherent to the system in order to determine which of the three behaviors was most likely in play. This gives you the ability to address the event and the people involved in a constructive way rather than simply reacting to the outcome. It can also show you how multiple behaviors can be associated with a single event, so that you can evaluate each behavior separately in order to more effectively determine the root cause.